Avocet FasGrips were rated for 105 psi. 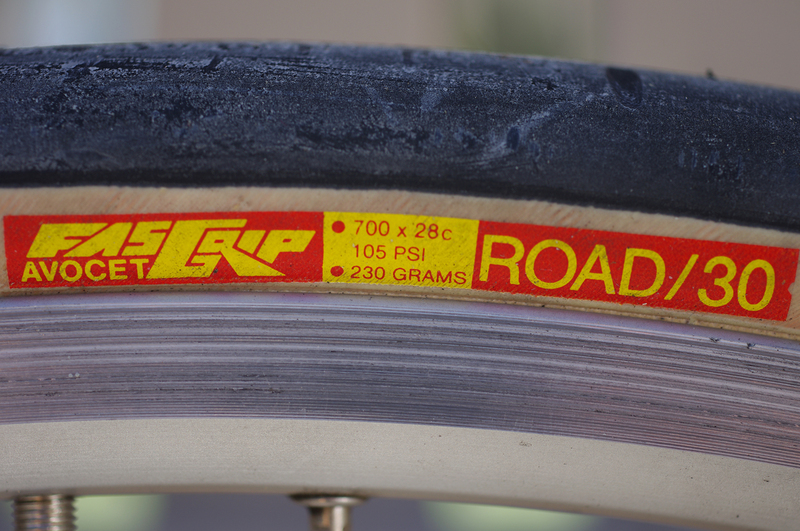 Lowering tire pressure to improve rolling resistance might work on some roads. I’ve ridden enough miles now to offer some results on what tire pressure works for me, after research indicated it’s better for lowering rolling resistance to run lower tire pressures. Your results will vary, unless you weigh the same as me and run the same tire and rim. I’m a little over 150 pounds, and my tires are Continental Gatorskin, 28 mm width, mostly, and 36 spoke Mavic Open Pro rims. Even then, there’s personal preference. I’m told that these rims are old fashioned, but I sure like them. I built my own wheels eight years ago and after 40,000 miles they’re in perfect shape. No wobbles. I started with 65 pounds rear pressure, 60 psi front. After struggling through 50 miles of riding, I decided this was too soft. The bike felt sluggish and steering was a chore. Believe it or not, that’s the recommended pressure on some charts. I can’t imagine that this pressure would be adequate under any circumstance, even with wide rims. The Mavic rim is 20 mm, but today’s wide rims run 23 mm outside. From what I’ve read, a narrow rim and wide tire causes the tire to squirm more than on a wider rim. I can believe it. I increased the pressure to 75 psi rear, 70 front. That felt good. I have full control over the bike in all situations and it doesn’t feel like the lower pressure is slowing me down. I’m thinking a pressure of 75-80 rear, 70-75 front is best for me. Of course, you can run higher pressures. I was at 95 rear, 90 front, or higher, for decades and never had problems. Backing off on the pressure might help reduce tire rolling resistance, but at my age it doesn’t matter, much. This entry was posted on August 16, 2018 at 8:42 am and is filed under News. You can follow any responses to this entry through the RSS 2.0 feed. You can leave a response, or trackback from your own site.